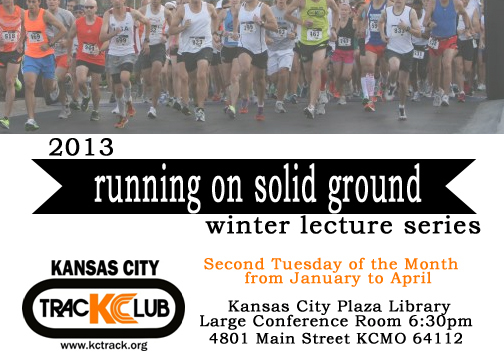 Running on Solid Ground Lectures Starting Soon! Running on Solid Ground Lecture Series is starting up again in January and the list of speakers is great for all of your training needs! No matter if you are a seasoned runner, walker or new runner you will love these informational sessions. The clinics are on the second Tuesday evening of the month from January to April at Kansas City Plaza Library’s (4801 Main Street, Kansas City, MO 64112) Large Conference Room from 6:30-7:30 PM with a social following each event at Spin Pizza (4950 Main St, Kansas City, MO 64112) which has graciously offered a 10% discount on food immediately following the event. KCTC with the support of Garry Gribble’s Running Sports will raffle apparel and gift certificates at each program. Clinics are free and open to the public. January 8th, Eladio Valdez III, Coach of The Runner’s Edge, presents a 12 week training strategy in preparation for your Half Marathon. February 12th, Rebecca McConville, sports nutritionist and avid runner discusses improving running performance and health with a self-assessment of your diet. April 9th, Coach Jimmy Butler, Assistant Cross Country and Track Coach, University of Missouri Kansas City, discusses motivational strategies in training and racing to assist you in achieving a personal record this spring. For questions contact Jim Greene at jamesgreene5@hotmail.com, Tom Cotter, thomasrcotter@gmail.com or KCTC at kctcrunner@gmail.com .